As the hardworking staff noted some years ago, the legendary Clark Booth – who died yesterday at the age of 79 – was the first journalist to expose the devastating effects of injuries sustained by professional football players. It was a 2012 piece by then-New York Times columnist Joe Nocera that resurrected Booth’s groundbreaking 1976 Real Paper report. 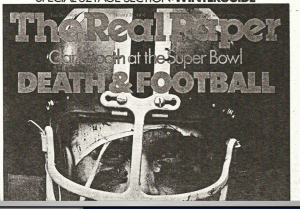 Thirty-six years ago, Clark Booth, a young Boston journalist, went to Miami to cover Super Bowl X. Though primarily a television newsman, Booth was on assignment for The Real Paper, an alternative weekly long since closed, for which he often wrote. His plan was to interview the players about the potential consequences of the injuries they suffered playing football . . .
[N]o one had ever written an article like that before Clark Booth went to Miami. I remember being thunderstruck reading it. D.D. Lewis of the Dallas Cowboys talked about having nightmares and his fear of breaking his neck. Lee Roy Jordan, a veteran Cowboys linebacker, was asked by Booth why he kept playing with a sciatic nerve condition. Here’s something that’s also amazing: Booth had a scoop that essentially no sportswriter wanted. It’s entirely unsurprising that Clark Booth, a reporter’s reporter, did have use for it. This entry was posted in Uncategorized and tagged Clark Booth, D.D. Lewis, Dallas Cowboys, football injuries, Joe Nocera, New York Times, repeated concussions, Roy Jordan, Super Bowl X, The Real Paper. Bookmark the permalink. Thanks for that. RIP, Clark Booth. A true gentleman.